This is book 3 of the Throne of Glass series, so my post assumes that you've read the first two (or that you've at least read my posts on the first two here and here). This review contains spoilers for both of them, and spoilers for this book will be under the cut. Okay, for real, I just cannot handle this series. It is so ridiculously epic that my heart just can't take it. When we last left off, assassin Celaena Sardothien was on a ship bound for Wendlyn, one of the last fae strongholds, and she had just revealed that she is in fact Aelin Galathynius, the lost princess. Remember how her parents had been brutally murdered when she was eight? Well, we have just learned that they weren't just ordinary people, but the heirs to the throne of Terrasen. The fact that she, Aelin, is still alive means that she is their rightful queen, and probably the only person left who might be able to take a stand against the King of Adarlan. In Wendlyn, she seeks an audience with Queen Maeve, the legendary faerie queen who also happens to be her aunt, in hopes of finding out how to defeat the King of Adarlan, who at the moment possesses some very powerful magical pieces that he is wielding to create evil creatures that will aid him in his further conquests of all the nations on the continent. But Maeve, who is no innocent herself, refuses to answer any questions until Celaena proves herself worthy and learns to accept and harness her own latent magic, so Celaena is stuck "training" with her top prince, Rowan, until she can do so. In the meantime, back in Adarlan, Chaol Westfall is stalling on his promise to go home to his own kingdom as he collaborates with the rebels. One of them is Aedion Ashryver, Aelin's cousin, who would love more than anything to see his rightful queen take the throne but who has been playing buttmonkey to the King of Adarlan as he bides his time. And Prince Dorian is finding it more and more difficult to control his own magical power, but concealing it is a necessity, since his own father would likely execute him for having it. - Celaena and Rowan - They make an awesome team. And I'm glad they didn't end up being a romantic thing. It's complicated, but I like how she didn't need him, as a romantic partner, but she did need him, as a fighting partner and as a mentor. They complement each other nicely, and that's because they each have their own darkness that they carry with them. - The witch subplot - To be honest, this part bored me. I still give the book 5 stars, but there was a lot of attention paid to these evil witches learning to ride dragons by request of the King of Adarlan, and I ended up just skimming through those parts. I'm assuming that their storyline will converge with the main plot in the next book, but they were kind of the least interesting part of an otherwise gripping story. - Celaena the assassin was already a total badass. Celaena's return as Aelin, carrying a bottomless well of fire magic, ready to burn down the world if it means freeing everyone from the evil reign of the King of Adarlan??? I cannot wait. But book 4 doesn't come out until September, and there will be two more books after that. I'm expecting a climactic showdown for the ages. 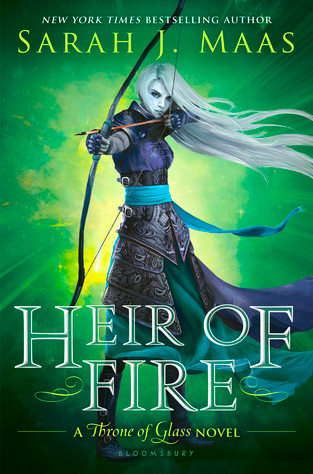 Don't let me down, Sarah Maas!